A lil of city one, where i've been staying there during my trip. thanks to jacky and his grand parents. jacky stay at block 6, level 20. City One is a residential area in Sha Tin which built by a consortium of New World Development, Henderson Land Development, Sun Hung Kai Properties and Cheung Kong Holdings. 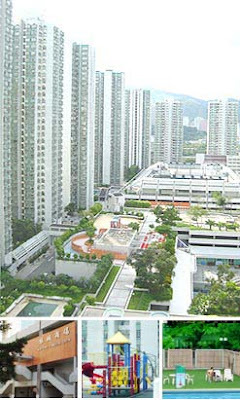 City One is the largest residential estate in the Sha Tin District. There are a total of 52 Blocks of residential buildings. These buildings each tower about 30 levels with units ranging from an area of 395 square feet (36.7 square meters) to an area of 1018 square feet (94.6 square meters) with different floor plans. It has been dubbed by leading architectural journals as the 'green lung' of Shatin.The construction of the City One Residential Apartments was completed in seven stages. It was started since 1981.